Hair is the fastest growing tissue in the body, second only to bone marrow. 35 meters of hair fibre is produced every day on the average adult scalp. The average scalp has 100,000 hairs. Redheads have the least at 80,000; brown and black haired persons have about 100,000; and blondes have the most at 120,000. 90% of scalp hairs are growing and 10% are resting. It is normal to lose 100 hairs per day from the scalp. You must lose over 50% of your scalp hairs before it is apparent to anyone. Many drugs can cause hair loss. Thyroid imbalance and iron deficiency are reversible causes for hair loss. Over 50% of men by age 50 have male pattern hair loss. Forty percent of women by the time they reach menopause will have female pattern (hereditary) hair loss. The average person's head has 100,000 to 150,000 hairs. A single hair can support up to 100 grams in weight and a whole head of hair could support up to 12 tonnes - the equivalent of two African elephants! A hair grows by 0.3 to 0.5mm per day - about 1 to 1.5cm a month and 12 to 15cm a year. African hair grows more slowly and is more fragile than European hair. Asian hair grows the fastest and has the greatest elasticity. The word shampoo comes from the Hindi 'champna', meaning to massage or knead. Early hair remedies read like witches' potions. One sixteenth-century doctor claimed to restore hair by applying a mixture of boiled slugs, olive oil, honey, saffron, soap and cumin to the head. But nobody knows if it worked. Children lose an average of 90 hairs each day, which increases to 120 by old age. Women often experience major, but reversible, loss of hair two or three months after giving birth. The massive production of the hormone oestrogen during pregnancy puts hair follicles into their 'growth phase'. After the birth, the hormonal balance is restored and the hair follicles go into the 'loss phase', causing a large number of hairs to fall out at once. African and European people are more prone to balding than Asian people. 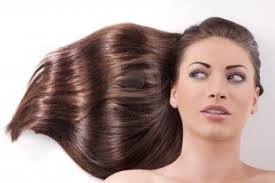 Hair is the second fastest growing tissue in the body. Only bone marrow is quicker. It is possible for your hair to turn white from shock... but not overnight! Hair pigment is produced in the hair shaft beneath the skin, so it would take about 13 days for any white hairs to show. One centimetre of hair can reveal much about your behaviour in the past month - what you ate, drank and the environments you encountered. In 2002, men and women in the UK spent more than £4 billion on razor blades to remove unwanted body hair. The first liquid shampoo to go on the market was Dop, which appeared on the shelves back in 1952. We now spend £4 billion pounds on hair products every year in the UK.